Polychaetes are often referred to collectively as “bristleworms.” I personally dislike that term, because there are so many negative connotations associated with it among reef aquarists. I also dislike it because it is used in so many ways by different people that it is virtually impossible to have a useful conversation using the term. For example, some people use “bristleworm” synonymously with polychaete to refer to the entire Class as a whole, other people use “bristleworm” only to denote those families with particularly long bristles (such as the Families Nereidae and Amphinomidae), and yet others use it to refer only to the group specifically known as “fireworms” (the Amphinomidae) in the hobby. Obviously, with such drastically different meanings, unless you know exactly in which way the term “bristleworm” is meant, it could refer to the nearly 10,000 currently described species of polychaetes, it could refer to a couple of specific Families of this class (just over a thousand species), or it could refer to a handful of potential pest species of worms that give the entire group a bad reputation, respectively. Like the term ‘bristleworm’ and ‘feather duster’ can have widely varying meanings, it is hard to have a specific conversation using such general and poorly defined terms that are often used in different ways by different people. Unlike the suspension-feeding corals I discussed in the March issue (Toonen 2002), these worms generate their own flow to capture food particles in addition to relying on the flow of currents to bring food particles to them. These worms extend their feeding pinnules (the colorful “crown” of the feather duster) and actively pump water through the ciliated tentacles to capture organic particles as they pass through the feeding pinnules (cilia are tiny hair-like extensions on the surface of cells that are under active control and used to generate currents to move water or mucus around). The worms then sort the captured particles in a number of ways before swallowing the ones that are of the correct size and taste. I can’t go into detail on how tube-dwelling feather dusters feed in the space of this article, but Ron Shimek (1998) has an article that covers ciliary suspension feeding for those interested in more detail. One thing I do want to make clear, however, is that worms feed from the bottom up. I always find it somewhat amusing when I see a well-meaning hobbyist try to target feed their worm by squirting some sort of particulate food into the center of the crown. Target feeding is difficult enough because the worms typically withdraw into their tubes as soon as they sense the current generated by spraying food towards them. However, most people are rather shocked to discover that the current is generated from the outside of the tentacles as water is drawn upwards into the crown from underneath and expelled towards the center of the ring on the upper side. Thus, by directing target feeding streams towards the center of the crown, even those worms that don’t retract immediately get little to no food from that well-intentioned effort because the food will be blown away from the animal by the feeding current it generates (the center of the crown is where their waste water gets pumped away — by target feeding the center of the crown, you’re effectively trying to feed their butts). Therefore, if you are trying to feed a feather duster worm, you should be directing the food to the side and below the crown, where it will be drawn through the feeding tentacles and feed the worm. 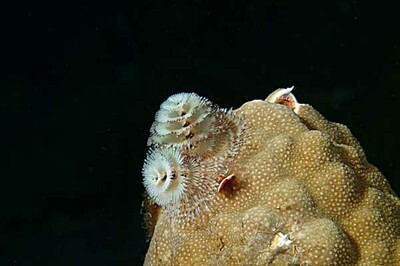 By creating water flow through the feeding tentacles, the worms actually use the eddies generated by having a branch of their crown in the flow (similar to a rock in a stream causes a swirling eddy which pulls objects in behind the rock) to cause food particles to swirl around that branch and get captured on the upper surface of the tentacle. Which brings me to my next point: what is the exact nature of the association between Porites coral and these worms? I’m not sure where the idea that Spirobranchus feeds on the mucus from Porites first originated, but I often see this claim repeated. Sometimes this idea is quite general, simply suggesting that the worms likely benefit from the presence of the coral mucus because the worms are an obligate associate of live corals. However, I have also seen highly specific claims, and I have heard that the mechanism by which worms benefit from the association ranges from the coral mucus trapping phytoplankton which the worms then eat, or even that there are nutrients in the coral mucus without which the worms simply cannot survive. However, as far as I can tell this is all aquarium urban legend, because there is absolutely no scientific research to support any such claims. It is true that the worms are obligate associates of live corals (i.e., they are rarely ever found in corals that are not live), but they are found in a variety of species, and Porites is actually one of the species in which they do the worst in the wild (I’ll explain this more below). It’s actually sort of a complicated system, and no one has really figured out exactly what is going on yet with either the species identity or the biology of Christmas Tree Worms, but I will try to synthesize the information that is available so far. In terms of the animals, the worms that we’ve always called Spirobranchus giganteus turn out not to be a valid species. Instead, there is an entire species complex of cryptic species (researchers use this phrase to describe morphologically similar species that have previously been considered a single entity), and several of the well-known ‘morphs’ of this misunderstood species have turned out to be completely infertile (i.e., they are incapable of fertilizing one another’s eggs) when crossed in the laboratory (e.g., Marsden 1992). Taken together, the few studies of Spirobranchus habitat preferences suggest that worms of a given species still inhabit a wide range of corals within a given region. Larval settlement appears to occur on dead portions of a colony adjacent to living coral tissue, even if the dead patch has been previously colonized by turf or filamentous algae (Nishi and Kikuchi 1996). Worm larvae show specific preferences for certain species of corals, and this larval preference seems to explain their abundance on different coral colonies as adults – larvae settle with much higher frequency in response to corals on which adults are common than on those on which adults are rare in the field (Marsden 1987; Marsden et al. 1990; Marsden and Meeuwig 1990). However, it gets more complicated, because worms are almost always clumped on coral colonies, and researchers have shown that larvae are also attracted to one another, and tend to settle in groups on certain corals (e.g., Marsden 1991). Thus, the presence of a worm on a coral increases the probability that future larval recruitment will occur nearby, even if there are uncolonized corals of the same species nearby. In the Caribbean, researchers found that larval settlement preference did not correlate with the total surface area of coral available to larvae (i.e., they did not choose the most abundant corals), mean coral colony size (i.e., they did not choose the largest coral colonies), nor with the rank of the coral in an aggression hierarchy (i.e., they did not choose the colonies most aggressive colonies that avoid overgrowth by others). Worms were found most frequently, and in the greatest abundance in colonies of Diploria strigosa, Porites astreoides and Millepora complanata. Montastrea annularis, Madracis spp. and Agaricia spp. also had a moderate number of live worms, whereas Porites porites, Diploria labyrinthiformes, Montastrea cavernosa and Siderastrea siderea were all sparsely colonized by Christmas Tree Worms (Hunte et al. 1990a; Hunte et al. 1990b; Marsden et al. 1990). As far as I can tell from the research done on these worms to date, however, the reason that they are found almost entirely in association with live corals has little to do with nutrition. I cannot find a single study in which nutrition derived from the living coral was considered a factor in the survival or growth of these worms. In fact, as far as I can tell from the research conducted to date, the association of worms with live coral seems to result more from a need for protection rather than nutrition. When researchers examined the boring invertebrate communities in corals that are live, and compared them to those communities in which 50%, or 100% of the colony was dead, they found big differences (Nishi 1996). In living corals, only 3 species of invertebrate were commonly found (a bivalve mollusc, a vermetid tube snail and the Xmas Tree Worms). The number of species boring through the colony and the amount of the coral’s carbonate skeleton lost to tunneling activity increases quickly with the proportion of the coral colony that is dead. Completely dead colonies were rapidly colonized by 17-18 species of boring invertebrates (the most significant and destructive of which are the sipunculans, or peanut worms) which remove an average of 14.2 kg of carbonate skeleton per cubic meter of reef per year (Peyrot-Clausade et al. 1992). In addition, parrotfishes and grazing echinoderms (including urchins, brittle & serpent stars) removed an additional 5.25 kg per m3 and together these boring activities are pretty likely to ensure that the worms don’t survive for long once the coral dies (Peyrot-Clausade et al. 1992). These boring invertebrates are responsible for the breakdown of dead coral skeletons into coral sand and play an important role in natural reef communities. 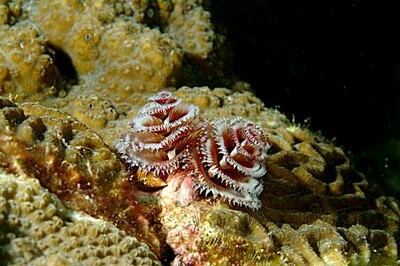 However, they make life very difficult for the Christmas Tree Worms, because it is unlikely that the boring invertebrates would differentiate between the calcareous tube of Spirobranchus and that of the dead coral. Removal of portions of the worm tube exposes the body of the worm to attack from predators, pathogens and other additional stresses not experienced when the worms inhabit a healthy live coral. It is therefore not surprising that the worms aren’t found in many dead coral skeletons, but it doesn’t mean that the worms are somehow eating coral mucus.